LynchyRightNow: What the H*LL is going on? Terrelle Pryor's Final Choices: Ohio St.,Michigan, and Penn St. If your favorite Coll. Ball team isn't in there don't worry, there is a limit to the number of scholarships each of these schools can award to top high school student athletes. Recievers and speed guys play down south, guys from Texas play in Texas, Offensive & Defensive Lineman generally stay in the conference "area" they live in, and Quarterbacks go where the women are: USC. So I would say I pretty much just summed up national signing day in about three sentences. This year was the most exciting signing day I've ever witnessed in my storied 9-month career as a sports blogger or as my minions refer to me as, an un-edited, bad grammar, and no experience sports columnist. I'll tell you why it was so exciting and you can tell all your friends to visit www.lynchyrightnow.com for free entertainment. 1. You may have been wondering who Terrelle Pryor was when I mentioned him earlier, so I'll enlighten you a bit. Pryor is an explosive Pennslyvania quarterback who has been heavily recruited from ALL TEAMS BIG 10. His list has been taken down to 3 remaining powerhouses, Michigan, Ohio State, and now Penn State. The new spread offense which will be implemented at Michigan in 2008 by former Moutaineer HC Rich Rodriguez seems appealing to Pryor, but he'll pass on them. Who wants to play for Joe Paterno and in Happy Valley??? Great fans, ancient coach, and no shot at a Rose Bowl bid. So why won't Pryor commit and go to Ohio State? Here is a thought, they've been embarrassed each of the last two years in the National Title game, the "sweater vest" puts a fullback and two TE's on the field and rushes the ball, hardly seems like the offense where Pryor would excel in. Scouts have said at times Pryor looks to be playing a game of pick up, he decides when to take off and opponents don't know how to play him. A bigger version of Vince Young with a simliar skill set, Vince turned out alright at Texas so I'm assuming Pryor could do the same in the right system. Pryor's father wants him attending Penn St. so my guess is . . . Nittany Lions. 2. If you haven't heard the story by now, I'm not sure your going to believe it. Nevada high school football player, Kevin Hart was recruited by NO ONE. On national signing day however, Mr. Hart held a press conference at his school, classmates, teachers, coaches, and of course the local media were all in attendence to find out where Mr. Hart would be playing football the next fall. 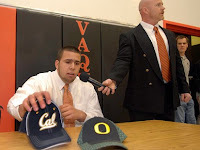 Kevin went so far as to purchase hats belonging to each of his final two schools, California and Oregon, then actually PLACED ONE OF THE CAPS ON HIS HEAD when is decision was made. Funny thing though, NEITHER OF THE TWO SCHOOLS HAD EVER EVEN HEARD OF KEVIN HART. Later coming out that Kevin had indeed made the entire thing up and one small lie had turned into a number of huge lies. Conclusion: See what happens when you try to impress a girl out of your league. Honestly though at the end of the day as much as I love watching College Football and even the off season of College Football, the student athletes are at the school to get an education and shouldn't that come first? The NFL will only be the employer to a select group of college athletes and for the countless others who got scholarships need to make the most of their opportunity not only on the football field but also in the classroom. Off of soapbox.